The service sector of industry also known as the tertiary sector is one of the three major sectors in the industry. The service sector emerged as the major sector of the economy both in growth and share in gross domestic product (GDP) in the 1990s. This sector has shown uniform growth and has shown that it is resilient even to the economic adversities even during down turn of the industry. The global automotive repair and maintenance services industry is expected to be worth almost $306 billion by 2015. The Indian automotive aftermarket is currently estimated at Rs. 33,000 contributing 2.3% of India's GDP. The automotive aftermarket for parts in India is a large and growing market that spans manufacturers, distributors, retailers, service providers, and garages. The size of the automotive service market in India is estimated at 8-10 billion USD. It is estimated that 50% of this sector is unorganized. The auto services sector currently employs an estimated manpower of 787, 7702 and increasing at the rate of 12% p.a. This service sector is more prevalent in the rural areas when compared to the urban areas due to lower penetration of the organized sector into this areas. This study was done among automobile repair workers in November 2012 to assess the prevalence of health problems among these workers and their awareness about personal protection equipment (PPE). The study was done in Vellore urban area within corporation limits. A pilot survey was undertaken to gauge the prevalence of health problems in automobile repair workers and their awareness about PPE. A cross-sectional study was designed, involving 120 automobile repair workers from Vellore corporation limits. Recruitment was done after obtaining a written informed consent and the participants were administered a local language translation of a semi-structured, pilot tested questionnaire to find out exposure to potentially harmful environments, use of PPE and prevalence of health problems. Peripheral sensory neuropathy was assessed with 2 g monofilament and peak expiratory flow rates (PEFRs) were found out using a peak flow meter. Workers who had entered the profession in the last 1 year were excluded from the study. Data entry was done using Epi-info 7.0 (CDC, Atlanta, USA) and analyzed using SPSS 17.0 (IBM Inc, USA). The survey was done during the month of November 2012, and involved a total of 120 automobile repair shops of which 106 (88%) workers responded. The age of the respondents ranged from 17 to 67 with a mean age of 30.8 and a standard deviation of 9.9. Nearly, 75% of the participants were in continuous employment in the same industry for more than 10 years. Of the surveyed workers, only 24 (22.6%) had completed high school education, with the rest mostly discontinuing formal education early. Only 4 (3.7%) of the automobile repair workers had received formal training or certification. Work mostly learned through apprenticeship with various senior workers. About 17% of the surveyed automobile workers were owners of the establishment too with the rest being paid employees. A majority (84.9%) did multiple general work in repairing and servicing of the automobile, while 16 (15.1%) were specialized workers involved in complex works such as radiator servicing, battery repair, painting work, gearbox works, etc. The mean income of the workers surveyed was around INR 5350 a month. All of the surveyed workers reported more than 40 h of working time per week with 3 (2.8%) worked in shifts. Nearly, half (45.3%) of the workers were not satisfied with their job, for reasons like low wages and strenuous work mentioned by most. Half (47.2%) of automobile workers reported stress at workplace and 26 (24.5%) said it adversely affected their family life in various ways. Seventy-seven (72.6%) workers did not have any social security while the rest had either provident fund or employees' state insurance scheme with only 7 (6.6%) having provision for paid sick leave. 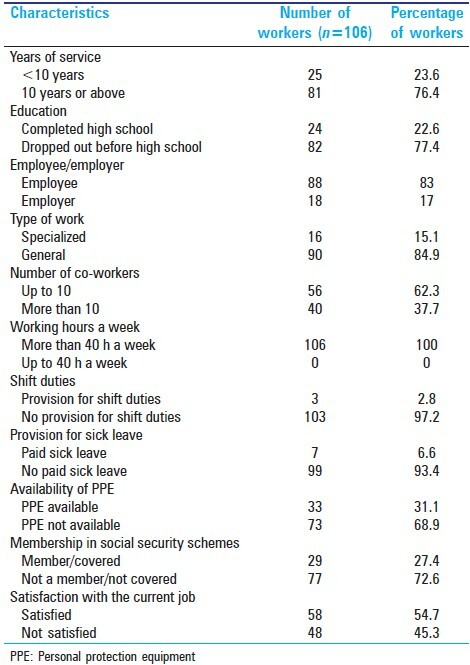 Thirty-three (31.1%) of the workers said PPE was available for use in the workshop, but only 9.4% of them use it regularly due to various reasons [Table 1]. Half (53) of the surveyed workers were unaware of any occupational diseases associated with their line of work, though 32 (30.2%) reported exposure to dust, 81 (76.4%) had exposure to heat, 50 (47.2%) mentioned exposure to chemicals which included battery acids, engine coolants, gear oil, engine oil, brake oil, lubricants, etc. Most (90.6%) of surveyed workers were exposed to petroleum products in some part of their work with 18 (17%) of the workers were involved in Battery servicing and electroplating works, which involved possible exposure to heavy metals. 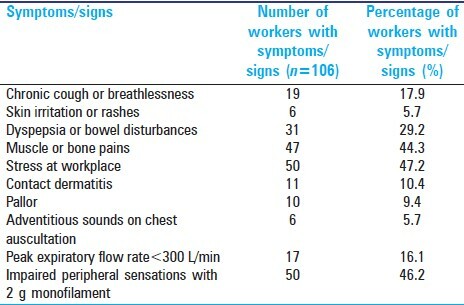 Nineteen (17.9%) of the workers reported cough or breathlessness lasting for more than 2 weeks, in the last 6 months while 31 (29.2%) had dyspepsia or abdominal pain during the same period. Forty-seven (44.3%) participants reported muscle and joint pains in the last 6 months while only 6 (5.7%) had any skin rash or skin irritation. Twenty-six (24.5%) reported of un-intentional workplace injuries in the last 6 months. A focused clinical examination of the participants revealed that 10 (9.4%) had pallor, 11 (10.4%) had features suggestive of contact dermatitis, while 6 (5.7%) had wheeze or crackles on auscultation. Seventeen (16%) of the workers had an average peak flow, <300 L/min and 50 (46.2%) had impaired sensations in their feet, when tested with a 2 g monofilament [Table 2]. Cross-tabulations and tests of proportions were done to find out association between different variables. Cough or breathlessness for more than 2 weeks was found to be significantly associated with age (P = 0.046) and exposure to chemicals (P = 0.032). Reduced peak flow was seen more with ages above 40 (P = 0.001) and exposure to heavy metals (P = 0.001). Peripheral sensory neuropathy was seen significantly associated with age (P = 0.001), years of service (P = 0.001), exposure to petroleum products (P = 0.03) and exposure to heavy metals (P = 0.018) [Table 3]. Half of the workers were unaware of any health problems due to their occupational exposures and thereby the use of personal protection is abysmally low. A very high proportion of workers had symptoms of cough, breathlessness, abdominal pain, abdominal discomfort and muscle aches, but only very few numbers has sought medical attention to the problems, main reason for which was poor finances coupled with high medical costs. The mean monthly income for the surveyed workers were INR 5350, which makes spending on healthcare a luxury, which most of them cannot access. The lack of paid sick leaves and any social security net can be read along with any data on poor health seeking behavior. Almost a quarter of the workers had un-intentional occupational injuries in the last 6 months. Though they work in a high-risk environment with chances of fire hazard, falls and chemical exposures, none of the workshops had fire-extinguishers, first-aid kits or any such safety devices. Furthermore, none of the workers had received any formal training in workplace safety or administration of first aid. The findings of high prevalence of peripheral sensory neuropathy in the surveyed workers, when examined using a 2 g monofilament may be due to the subjective nature of the test and poor foot hygiene, as the examination was done in the workplace itself which was recognized as a limitation of the study. Also the validity of PEFR measurements using peak flow meters is sub-optimal, as the techniques of measurements are difficult to teach and highly subjective in nature this was a limitation. This study was aimed as a pilot study in giving directions for future research in health problems affecting unorganized and marginalized occupational groups such as automobile repair and service workers. Further research employing advanced techniques like blood picture, heavy metal assays, nerve conduction studies, biothesiometry, pulmonary function tests etc., are needed. The authors would like to thank Dr Kuryan George, Professor and Head, Department of Community Health, Christian Medical College, Vellore, Tamil Nadu, India. 1. Automotive Service Industry: Market Research Reports, Statistics and Analysis. Available from: http://www.reportlinker.com/ci02295/Automotive-Service.html. [Last accessed on 2013 Sep 26]. 2. Auto Serve-2012. Available from: http://www.ciiautoserve.in/autoserve/indus.php. [Last accessed on 2013 Sep 25]. 3. Skill Gaps in Indian Automotive Service Sector. Available from: http://www.kpmg.com/IN/en/IssuesAndInsights/ArticlesPublications/Documents/Skill%20Gaps%20In%20Indian%20Automotive%20Service%20 Sector.pdf. [Last accessed on 2013 Sep 25]. 4. Bhasker VV. Indian auto component industry: A decade of growth and way forward. Res J Manage Sci 2013;2:19-27. Available from: http://www.isca.in/IJMS/Archive/v2i3/4.ISCA-RJMS-2013-014.pdf. [Last accessed on 2013 Sep 26]. 5. Joan ME. Leaving it up to the workers: Sociological perspective on the management of health and safety in small workplaces. Occup Environ Med1997;54:477-82. 6. Schwartz E. Proportionate mortality ratio analysis of automobile mechanics and gasoline service station workers in New Hampshire. Am J Ind Med 1987;12:91-9. 7. Goldberg P, Leclerc A, Luce D, Morcet JF, Brugère J. Laryngeal and hypopharyngeal cancer and occupation: Results of a case control-study. Occup Environ Med 1997;54:477-82. 8. Nunez CM, Klitzman S, Goodman A. Lead exposure among automobile radiator repair workers and their children in New York City. Am J Ind Med 1993;23:763-77. 9. Singh B, Dhawan D, Nehru B, Garg ML, Mangal PC, Chand B, et al. Impact of lead pollution on the status of other trace metals in blood and alterations in hepatic functions. Biol Trace Elem Res 1994;40:21-9. 10. Hansen ES. Mortality of auto mechanics. A ten-year follow-up. Scand J Work Environ Health 1989;15:43-6. 11. Attwa E, el-Laithy N. Contact dermatitis in car repair workers. J Eur Acad Dermatol Venereol 2009;23:138-45. 12. Chattopadhyay O. Pulmonary function in automobile repair workers. Indian J Community Med 2007;32:40-2. 13. d'Errico A, Cardano M, Landriscina T, Marinacci C, Pasian S, Petrelli A, et al. Workplace stress and prescription of antidepressant medications: A prospective study on a sample of Italian workers. 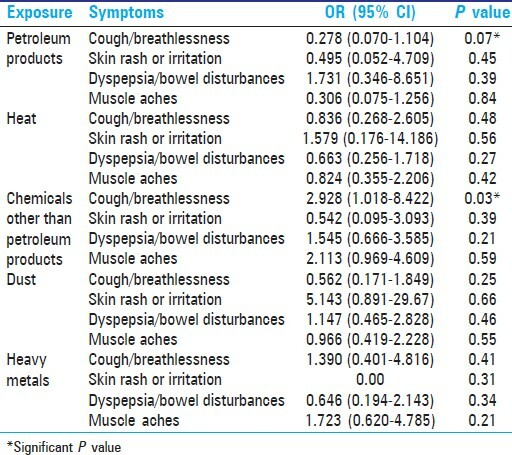 Int Arch Occup Environ Health 2011;84:413-24.